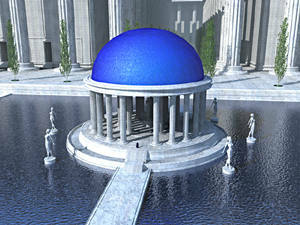 "Dome of the Blue Seeress"
Sticking with the planetscape theme here. I wanted to see if I could use Oculus Medium to create icebergs here. 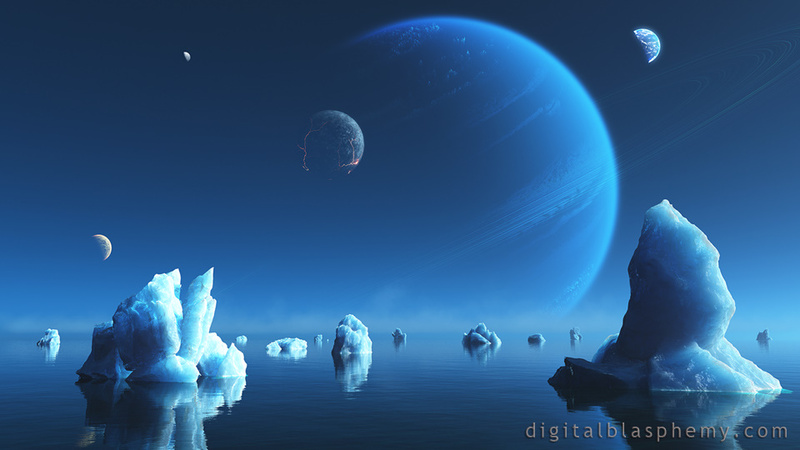 The planets are a mix of Vue rendered "planetary landscapes" (spherical terrains) and one that I created in Lightwave. I love it!! Awesome! You know they say that having a fish tank lowers your blood pressure, and it's a fact. But for me this is my fish tank! "one of my favorites in a long time"
I love the ice planet style wallpapers! That may seem like an interesting Review Title, but I have to say that I love when some of your former works creep into your newer works. Case in point: the Crucible planet making an appearance here. It's like a little gift from the past. "Perspective distortion on multiscreen is a dealbreaker for me." Unfortunately for my triple-screen use, the curve distortion in the multiscreen views is a dealbreaker for me using this as a background. I gave it a couple days but it just ruins the illusion of the setting for me. I like the light source shining on the icebergs. They edges look very realistic. It looks all the more cold because of the partially molten moon in the sky. I could almost wish it was fully molten - extra contrast. "Love it more and more"
Having this up on my dual work monitors and staring at it for hours now I'm realizing this is actually a masterpiece. I originally loved it at first sight now it's quickly becoming a favorite it's just so crispy man. Have you tried the version for the Samsung Galaxy? Once again brilliant Ryan, but why no Android HD anymore? Amazing image. It genuinely looks cold. The ice is superb, I think Oculus Medium worked out nicely. Wonderful, Ryan! I love this! Very nice. It does remind me of a couple of other images you've done, such as "Arctica" and "Boreal", with a touch of "Crucible" as well. Overall, very impressive -- and just the thing to greet summer with! This is going up there with one of my all time favorites, Niflheim. Love This One, great colours, awesome realism and great theme, in agreement with the comment that Tyler made. Great render Ryan. I too like the more minimalist look to wallpapers and think this one is spot on. The colors and layout are great! Love the satellite planets right off the bat. Brilliant integration of what looks to be Crucible (http://digitalblasphemy.com/preview.shtml?i=crucibleplanet) and Skyward (http://digitalblasphemy.com/preview.shtml?i=skyward3). Not sure if that was by design or not but it works. Love this one, clean lines, great coloring, calming effect. Great work!! Gave this a 1 by mistake.....9 IMO all day long. Love, love, love your planetscapes. My only critique here is that often your icebergs seem to have very flat surfaces when they hit the waterline: the lines are so very straight where the ice meets the water, no sense of unevenness. But otherwise, the ice looks so dang real and I love how your planetscapes inspire wonder and awe and the imagination. Morning Ryan... someone else mentioned this and I have to agree. I really like to blue and white tones to this drawing. I have finally replaced the magic mushrooms on my desktop. This is a nice one Ryan. I love the blue and white tones to this. Great Job!!! You might be right. I walk by an old print of "Majesty" in my house just about every day and this piece is sort of a homage to that (note the earthlike planet). I like the more minimalistic planetscapes like this one. To me, though, it would be better with just the single large planet in the background. The others seem superimposed and out-of-place.